Our Lady of Lebanon is a bronze statue of the Virgin Mary, painted white for added splendour. It dates back to the 19th century, erected on a hill overlooking the beautiful Bay of Jounieh. A major Lebanese pilgrimage site, the statue is also a roundly-celebrated tourist attraction. Towering 2,130 feet (650m) above sea level, unforgettable views unfurl at sunset when the western sky darkens over the sea. An added benefit is the cable car system, offering thrilling and affordable rides up the pine-forested mountain towards the shrine. 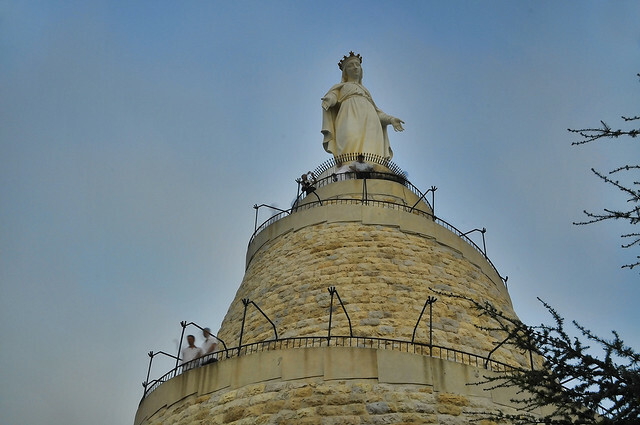 Those looking to make a day out of their trip to see Our Lady of Lebanon can also walk up the steep hillside, about 5.5 miles (9km) from the town of Jounieh to Harissa at the summit. Jounieh is located just 12.5 miles (about 20km) north of Beirut, considered an obligatory stop for holidaymakers in Lebanon.